In Asprova APS, resources are broken into periods of working time and non-working time. A working time is a period of time in which operations/tasks can be assigned. Within a working time period, there is also a resource quantity, which represents the maximum size or number of operations that the resource can handle simultaneously within that particular period of time. It is possible to have the resource quantity increase or decrease over the course of the working time period. For example, there may be a resource representing a group of workers whose number of members changes over time, so that from 9:00 to 18:00 there are 4 people, from 18:00 to 20:00 6 people, from 20:00 to 7:00 of the next day 2 people, and from 7:00 to 9:00 no one. You can specify working times using the Calendar table and the Shift table. Working times are specified for each resource and day, that is, for each cell in a standard resource Gantt chart with a unit of one day. Note, however, it is possible to specify a day demarcation time. For example, you may refer to something like Friday 8:30 to Saturday 8:30, rather than Friday 0:00 to 24:00. For day demarcation time which is 0:00, the settings will apply from 0:00 to 24:00. For day demarcation time which is 8:00, the settings for 6/2 will actually apply from 6/2 8:00 to 6/3 8:00. Similarly, for day demarcation time which is 20:00, the settings for 6/2 will actually apply from 6/1 20:00 to 6/2 20:00. Note that the relationship between the date and the time period to which it applies switches at the boundary of 12:00 noon. A working time period is generated for the range, starting from either [Display start time] or [Assignment start time], whichever is earlier, specified in the project settings and ending at either [Display end time] or [Assignment end time], whichever is later, which is also specified in the project settings. For example, if the display start time is 2005/2/28, the assignment start time is 2005/3/1, the assignment end time is 2005/3/31, and the display end time is 2005/4/1. The working time will be generated for the period from 2005/2/28 to 2005/4/1. The working time defined outside the working time period is considered to be 24 hours with resource quantity of 1. This is to save memory. Set [Display start time] and [Display end time] to generate the correct working timings within the working time period. From Ver.6.1.2 onwards, by using chart specific time periods, it is possible to reduce the number of time periods shown. For example, showing less of the past. 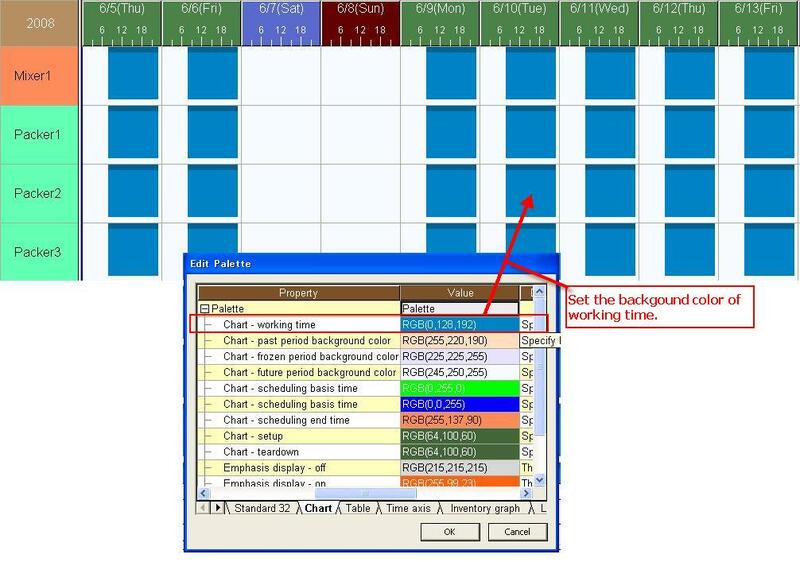 If [Show working time above use instruction bars] in the resource gantt tab is set to "Yes", the working time would be drawn above the use instructions. The color for the time text would be a little darker than usual. The color of the working time can be changed via the Display color settings. If the use instructions suspend time display method is "NONE", it would be hard to see the working time periods. 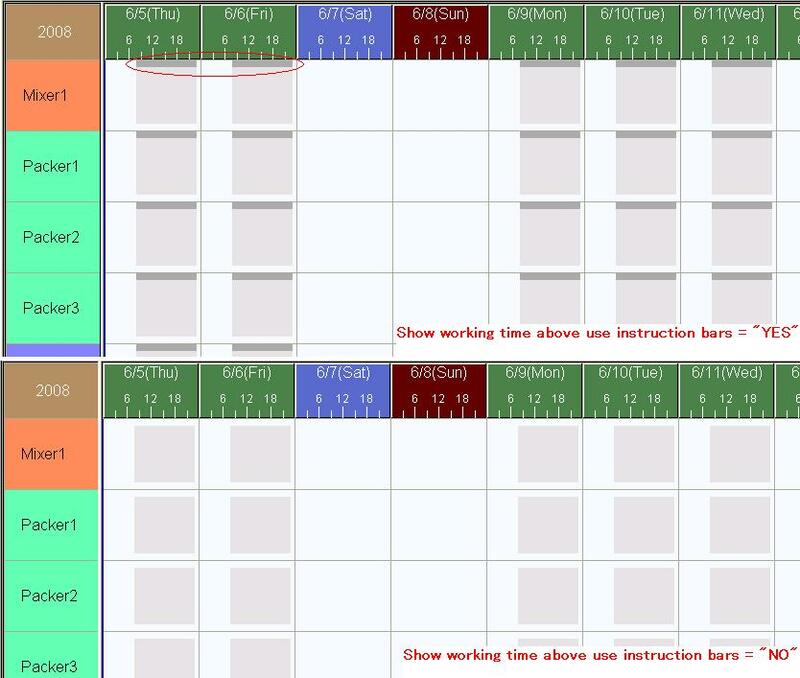 However, by setting "Show working time above use instruction bars" to "Yes", those working periods can be seen.